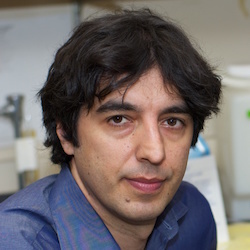 Valter D. Longo is an Italian biogerontologist and cell biologist known for his studies on the role of starvation and nutrient response genes on cellular protection aging and diseases and for proposing that longevity is regulated by similar genes and mechanisms in many eukaryotes. He is currently a professor at the USC Davis School of Gerontology with a joint appointment in the department of Biological Sciences as well as serving as the director of the USC Longevity Institute. In his 1997 doctoral thesis he described a new way to study aging in S. cerevisiae (chronological life span) and described in parallel with the work of others in C. elegans the first aging regulatory pathway which, in yeast, involved Ras, adenylate cyclaseand protein kinase A, protective transcription factors and antioxidant enzymes. In 2001, he led the USC team that discovered that inhibition of the growth stimulating Mammalian target of rapamycin/S6 kinase pathway by deletion of the SCH9 gene caused a 3-fold life span extension in yeast. Analogous genes including adenylate cyclase, PKA, Tor and S6K were recently shown to also regulate aging in mice. In 2008 the Longo laboratory showed that inactivation of the Tor-S6K and Ras-PKA pathways is responsible for a major portion of the effects of calorie restriction on life span and together with calorie restriction causes a 10 fold life span extension. The Longo laboratory also showed that the inhibition of IGF-1 and of the aging promoting pathways by starvation can be exploited to protect normal cells and mice but not cancer cells from chemotherapy (Differential Stress Resistance, DSR). Preliminary studies in humans suggest that the DSR effect may be applicable to cancer patients. In 2011, Longo in collaboration with the group of endocrinologist Jaime Guevara-Aguirre in Ecuador, demonstrated that the aging promoting effect of the IGF-1, Tor-S6K, Ras and PKA pathways on aging is potentially conserved in most eukaryotes by reporting that a human population with deficiencies in IGF-1, Ras, PKA, and Tor displays a major reduction in genes that promote aging as well as a very low incidence of cancer and diabetes. Longo, a leading force in the formation of USC’s Biology of Aging program as well as the director of the USC Longevity Institute, also launched the USC Davis School of Gerontology’s first study-abroad program, a summer class in the nutrition and genetics of aging in Italy. In 2011, he was profiled on Through the Wormhole with Morgan Freeman for his longevity-related research.